The Victorian Government is working in partnership with the Victorian Aboriginal community towards self-determination. This agenda will be supported by strengthening the Aboriginal leadership pipeline and providing more access to timely development opportunities and support. VPSC has a role to play in outlining a set of strategic objectives that will work to collectively have a positive impact on the workplace. For the public sector this means an ongoing commitment to meaningful careers for current and future Aboriginal staff. Throughout these documents, the term Aboriginal is used to refer to both Aboriginal and Torres Strait Islander people. 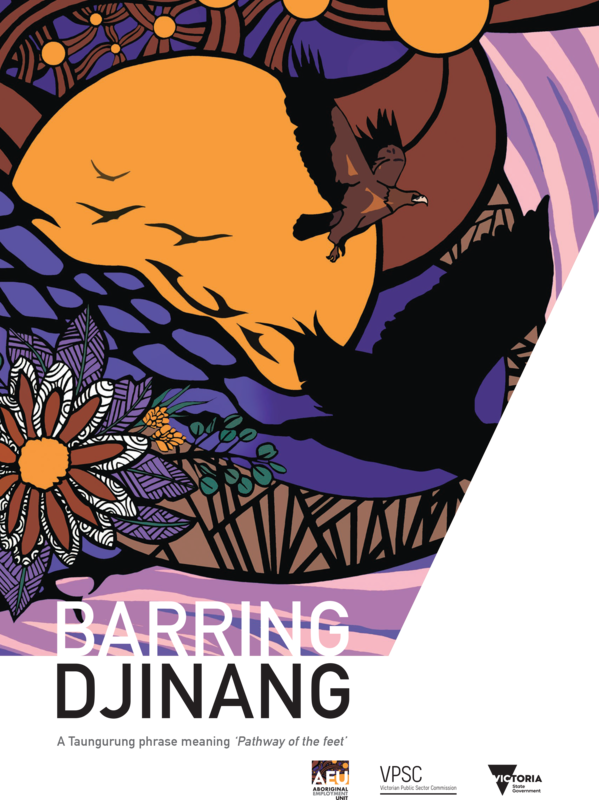 Barring Djinang is the Victorian Government’s new 5 year strategy to enhance Aboriginal employment outcomes across the Victorian public sector. This brochure is from the strategy launch in July 2017.